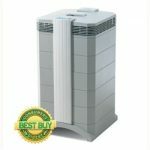 Air Purifiers: How to Choose. Air pollution is just another one of those problems we’ve learned to live with, but it’s not so bad. After all, these days most people don’t spend much time outside. Right? So what’s the problem? It’s true that the average person spends 90% of their life indoors, but it isn’t true that indoor air is fine and dandy. Indoor air is recycled air and no matter how clean your home is, it is filled with assorted forms of contamination, from dust particles to tiny insects, chemicals and of course bacteria. Air pollution is not just an outdoor issue, so what can you do? Fortunately it is perfectly possible to have a device in your home which can scrub out the vast majority of unhealthy bits and pieces and make a significant improvement to the quality of the air in your home. This is an obvious boon to those who suffer from asthma, rhinitis and other allergies, but recent research seems to indicate that improving air quality can have a significant effect on other conditions of which heart disease is only one, so what sort of device should you look for? The reason(s) you want an air purifier; be sure the purifier you choose does actually remove the particles you want to avoid. The size of the area whose air you way to control. The larger the area the more powerful the device needed to clean and cycle the air. Your budget. Powerful systems use more electricity, but that’s not the only running cost. Some systems use a filter which needs to be replaced at regular intervals, others use ultraviolet lamps and yet others use a combination. Be sure you know how much the unit will cost to run. Air purifiers such as the IQAir Air Purifiers use a technology known as a HEPA (High Energy Particle Air) filter. This is a simple system which was invented in the 1940’s for use in the Manhattan project. Air is forced through one or more mesh filters. To be classed as HEPA an air filter must be able to remove 99.97% of all airborne particles 0.3 m in size or greater; since bacteria are typically around 0.5 to 5 m in length (though some are much larger) this is more than adequate to remove most molds, spores and bacteria from the air. But HEPA is not your only choice. Other air purifiers use ultra violet light to kill bacteria, viruses, spores and sterilise the air; some have ni filters to replace, others combine the UV light with standard filtration for the best of both worlds. Some of these units are portable and can run on the on the 12 outlet of your car, you really can have clean air wherever you go. If you are concerned about the quality of the air in your home, be sure to ask the following questions before deciding which air purifier is for you. a) Is the device portable or not? c) What grade is the filter (if fitted) and will it cope with the allergies etc.you need it for. d) Does it cope with odors including pet odors. e) Does it trap pet allergens. f) What area does it cover. g) How long will the filters last. h) How much are the replacement filters, how easy are they to find? Air is pretty fundamental to everything we do. Making sure it’s of good quality seems like simple common sense.